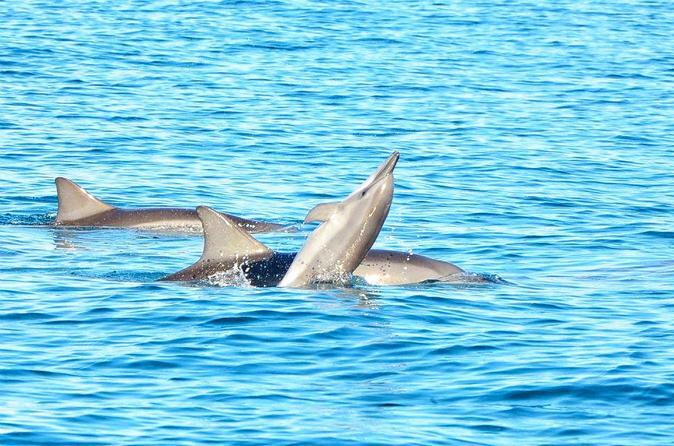 Observe dolphins and swim in their habitat during this 7-hour trip to Benitiers Island from Mauritius. On a private speedboat, travel to the dolphin habitat, passing the famous Crystal Rock on the way. Spend time relaxing and swimming at Benitiers Island. Breakfast, lunch, and round-trip hotel transportation from Port Louis included. Get ready bright and early for pickup at your hotel; breakfast is served at the marina at 7am, and pickups will commence prior to that. Exact time depends on the location of your hotel. Transfer to the marina, where you'll enjoy a light continental breakfast before departing. En route, listen to your skipper's commentary about how to have a safe and environmentally responsible experience in the dolphins' natural habitat. Learn about the different species, habits, and behavior you may encounter. Spend about 2.5 hours out on the water searching for and swimming around the dolphins. Back on the boat, pass the famous Crystal Rock on the way to Benitiers Island. Snap photos of the island's Le Morne Mountain, then arrive to spend a few hours relaxing and exploring. The crew will prepare lunch, which will be served to the accompaniment of live music. Head back to Mauritius for drop-off back at your hotel around 2pm.